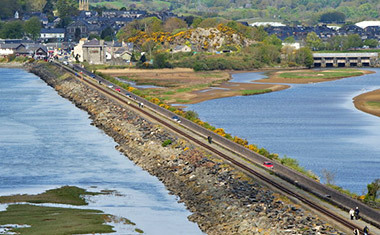 The Grade II* listed causeway known as Y Cobb crosses the mouth of the Afon Glaslyn and the sands of Traeth Mawr, carrying the A497 (Britannia Terrace) and a narrow gauge railway line that connects Caernarfon and Blaenau Ffestiniog in Wales. The causeway has been widened several times and is well used by visitors and local people. The construction of Y Cob was sponsored by William Alexander Madocks (1773-1828), who was Member of Parliament for Boston in Lincolnshire 1802-20. In Wales he owned the Penmorfa Estate and founded the Gwenydd towns of Porthmadog and Tremadog. His idea was to build the causeway as part of a longer coastal transport route and to use for agriculture the Traeth Mawr (great beach) it encloses. In 1807, Madocks obtained a private Act of Parliament to enable construction of the embankment. His engineer was John Williams (c.1778-1850) of Anglesey, who worked with Madocks on a number of projects. The 1.3km long causeway was intended to reclaim 2,830 hectares of land from the tidal Afon Glaslyn. Its eastern end is at Boston Lodge on the hilly peninsula of Penrhynisaf and its western end is on the small island of Ynys Tywyn. Barracks were erected at both places to house the workforce. The embankment was constructed by tipping stone from two 914mm (3ft) gauge tracks carried on piled timber trestles. Tidal forces and the river flow meant that the rocks did not settle into the seabed and were carried away almost as soon as they were laid. Madocks and Williams overcame this by placing the stones onto a layer of rush matting, which prevented wave erosion, a technique that Madocks may have learned in Lincolnshire. When the 6.4m high embankment was completed, its base was 27.4m wide and its top 5.5m wide. The river was diverted into the passage between island and mainland (now spanned by Britannia Bridge), scouring the channel that became Porthmadog Harbour. Y Cob opened on 17th September 1811, having cost around £60,000 to construct. Horse-drawn vehicles were charged a toll of one shilling (5p) and other users sixpence, amounts fixed by the 1807 Act. The fees were collected from the toll house (SH584379) at the east end, opposite Boston Lodge. In February 1812, a severe storm breached the embankment and major repairs were required. Madocks had overspent on the original construction and was in financial difficulties. However, the road had already become a vital link and it’s reported that some 900 men from north Wales, accompanied by more than 700 horses, offered their labour to repair the damage. By 1814, Y Cob was open to traffic once more. The Ffestiniog Railway (NPRN 34660) was constructed in 1833-36 to transport slates from Blaenau Ffestiniog to Porthmadog Harbour for export, and Y Cob was extended to accommodate both road and railway. In 1836, a lower berm was added to its inland (north) side to carry a new two-lane toll road while the original higher structure was modified to carry the single track of the narrow gauge (597mm or 1ft 11.5in) steam railway, with an adjacent footpath to the north. The higher seaward side of the causeway is armoured with substantial rock boulders. The lower inland side has a stone wall with a rock apron at its base, and a partially grassed bank. The levels are separated by a vertical retaining wall constructed of random slate blocks, dry laid perpendicular to the slope. Parapet walls of slate and stone, 500mm to 1m high, run beside the road and railway. At the east end of Y Cob, steps from the higher level lead down to the shore and the roadway. A through passage, with a semicircular arched roof, was also built under the railway beneath the curve of the tracks approaching Boston Lodge. In 1946, the slate railway closed. It was restored in stages during 1954-82, and now operates as a heritage line on its original route between Boston Lodge and Blaenau Ffestiniog. On 28th April 1978, the Rebecca Trust bought Y Cob and donated the proceeds of the 5p tolls to local charities. In February 1991, the causeway was Grade II* listed, by which time the passage under Boston Lodge had been infilled and the seaward side masonry parapet walls rebuilt in concrete. In 2002, the embankment was widened on the landward side to provide a cycleway and footpath to the north of the road. In 2003, ownership of the embankment passed to the National Assembly for Wales and road tolls were abolished on 29th March. In 2011, the Porthmadog bypass opened, reducing road traffic congestion at Y Cob. In the same year, the restored narrow gauge Welsh Highland Railway began operating services between Porthmadog and Caernarfon. It had to share the single platform at Porthmadog’s Harbour Station with Ffestiniog Railway traffic between Porthmadog and Blaenau Ffestiniog, with trains shuttling back and forth on each half of the line. The present Welsh Highland Railway is a reconstruction of a line that operated between 1922 and 1937, though its origins date back to several 19th century railways along the Caernarfon to Porthmadog route, which began in 1828 with the horse-powered Nantlle Tramway. Between 1997 and 2011, having gained control of the Welsh Highland Railway’s track bed, the Ffestiniog Railway restored the line. In October 2011, work began on a £1.2m scheme to improve the west end of Y Cob in which the contractor was assisted by more than 150 volunteers and Network Rail apprentices. The project included the widening of a 260m long section to enable an extra platform to be constructed at Harbour Station without altering the road layout. A new seawall was constructed on the extended embankment and the rail alignments in the area reconfigured. The causeway footpath was resurfaced and partly fenced. In an echo of the original construction, the embankment widening of 2012-13 involved excavating a trench in the seabed and lining it with a geotextile membrane before placing some 40,000 tonnes of graded rock fill and armour. Stone was sourced from nearby Minffordd Quarry. Train services were halted between November 2013 and 2014 while the tracks were lifted and relaid. Plastic sleepers were used instead of timber or metal — the first for a narrow gauge line. A new signal box was provided and station facilities enhanced. From 22nd March 2014, trains between Blaenau Ffestiniog and Caernarfon have been able to run on two lines at Harbour Station, so providing a through service. The station’s official opening ceremony was held on 22nd May 2014.